PHOTO GALLERY with Panoramics of Sandias, Manzanos and Jemez Mtns. CLICK ON PICTURE FOR LARGE PANORAMIC VIEW FROM CREST HOUSE THAT WILL SCROLL ITSELF IN YOUR BROWSER! Handheld composite panoramic view from the deck of the Crest house with Canon A40 in stitch mode, March, 2003. Ken Schneider. We have moved from New Mexico-- The Rosy-Finch Project has NEW COORDINATORS! As we drive to Sandia Crest from our home at 7000 ft. elevation in the Piñon-Oak-Juniper woodlands , we pass through the Ponderosa belt (7500-8000 ft.) into the mixed conifer forest at about 8000-9500, then into the fir-spruce forest at the top. This provides a great variety of habitats for wildlife. The area suffered some wind damage and there are plans to make the viewing area more "birder friendly." For updated information, link to Ken's Blog and comments here. One of our favorite stops on the way to Sandia Crest is the Capulin Spring Picnic Area in the Cibola National Forest in eastern Bernalillo County, which is east of Albuquerque. A spring has been a constant supplier of fresh water to a hollowed out log that serves as a watering trough and a bird bath. The best times of the year to visit the log are during spring and fall migration, but it can be productive any summer day as well. We try to get there early in the morning, but it is usually reliable any time of day. Since it is the only source of water in a wide area of a mixed conifer forest at about 8900 ft. elevation, it can attract almost any creature that calls the forest its home. A slight bluff overlooks the log, permitting great views of its long axis from about 20 - 30 feet away. We bring folding chairs and sit very quietly. We have been rewarded with views not only of birds, but also deer, squirrels, chipmunks, weasels, and even a bear. For those with limited mobility, there is a parking space level with the viewing area, only about 20 steps away. Our list of birds seen at the log is quite long. 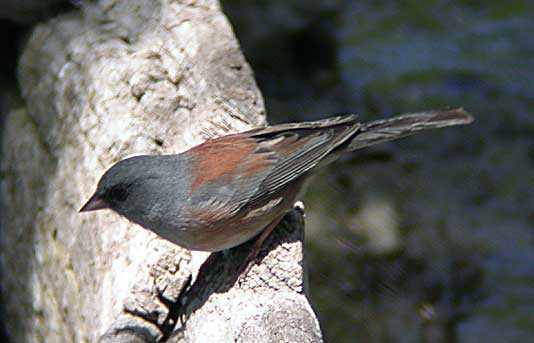 In addition to the permanent residents such as Steller's Jay, Red-breasted Nuthatch, Pine Siskin, Dark-eyed (Gray-headed) Junco, Red-naped Sapsucker, Brown Creeper and Hermit Thrush, highlights include wintering Cassin's Finch, often with Clark's Nutcracker, Townsend's Solitaire, Red Crossbill, and Evening Grosbeak. Usual summer residents are Warbling Vireo, Western Tanager, Band-tailed Pigeon, Black-throated Gray, MacGillivray's, Virginia's and Grace's Warbler, and Green-tailed Towhee. Some summers find the Evening Grosbeak, Cassin's Finch and Red Crossbill staying on to breed. The Dusky Flycatcher arrives in early June and most years may be found in the extensive groves of small New Mexico Locust at the far (north) end of the Snow Play parking area just above the Spring (Enter the Snow Play Area by way of the gate which is closed to automobiles in summer, and walk directly, all the way in). There is also a path that continues north, and the Duskies may be found less than a hundred yards into that grove of New Mexico Locusts). Just after sunset in June and July, Northern Pygmy-owl, Flammulated Owl, and sometimes Saw-whet Owl and Common Poor-will may be heard nearby. The Capulin Spring Picnic Area is on NM 536 (the road to Sandia Crest) about 8 miles west of its junction with NM 14; the latter is about 6.5 miles north of I-40, exit 175, which is about 12 miles east of Albuquerque city limits. This area is closed during the winter. DIRECTIONS FROM ALBUQUERQUE: Take I-40 East to Exit 175 (Cedar Crest/ NM 14). Exit 175 is about 20 miles East of the I-25 / I-40 intersection. Exit right from I-40 but bear to the left and then pass under I-40 to the north, following NM-14. Follow NM-14 signs North past Cedar Crest, total of about 6.5 miles, to NM 536 West, also known as the Crest Road or the road to the Sandia Ski Area. There is a gas station on the right side of the street just before the Left turn. Take NM-536 about 8 miles up to the Capulin Spring Picnic area, park and walk down the narrow paved road about 1/2 mile to the loop at the end. Walk up to the little hill that overlooks the log and spring. 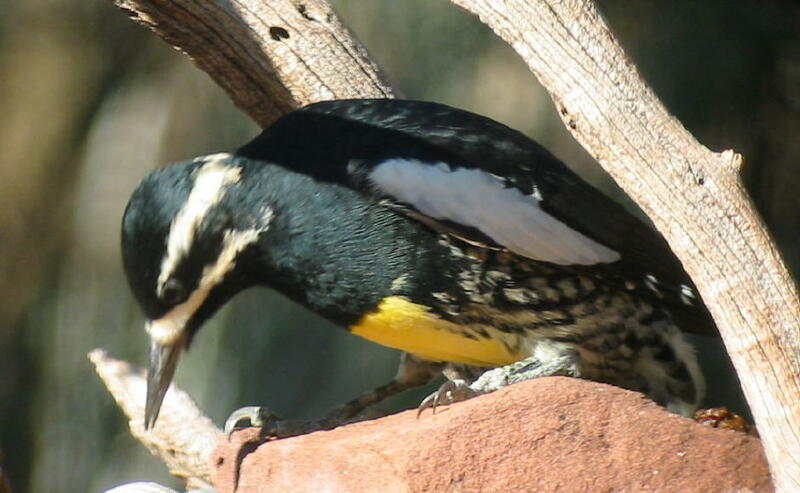 The US Forest Service proposed alternative plans and a comprehensive environmental assessment for construction around the Capulin Spring "Bird Log" in Cibola National Forest. Three alternatives were considered. Both Alternatives #1 and #2 would relocate the main entrance to the Spring and Snowplay area in the interest of highway safety. Both would replace the deteriorating log with a new one from a local tree. Both alternatives #1 and 2 would also improve the bird observation area above the spring by removing the picnic table and fire pit, replacing them with benches for comfortable and ideal observation of the log and birds. Alternative #1 would improve the roadways and parking/ picnic/ gathering facilities, but also attract many more visitors to this pristine area. Alternative #2 would close the entire roadway below the one-way road gate to vehicular traffic. Alternative #3 is actually to do nothing. Alternative #1 would have offered great improvements in access for the general public and the handicapped, while #2 provides less disturbance for birds and birders, yet would pose a problem accessing the log viewing area for those with limited mobility. Both would replace the log with a new one and improve the bird viewing area. USFS chose Alternative #2, and that funds were allocated to allow the project to be completed. "The Log" was not replaced, and it continues to attract wildlife during the warm months. The area is closed during the snow season but may be accessed from the Snaow Play parking lot when it is open. The decision was welcomed by birders, despite some temporary inconvenience. 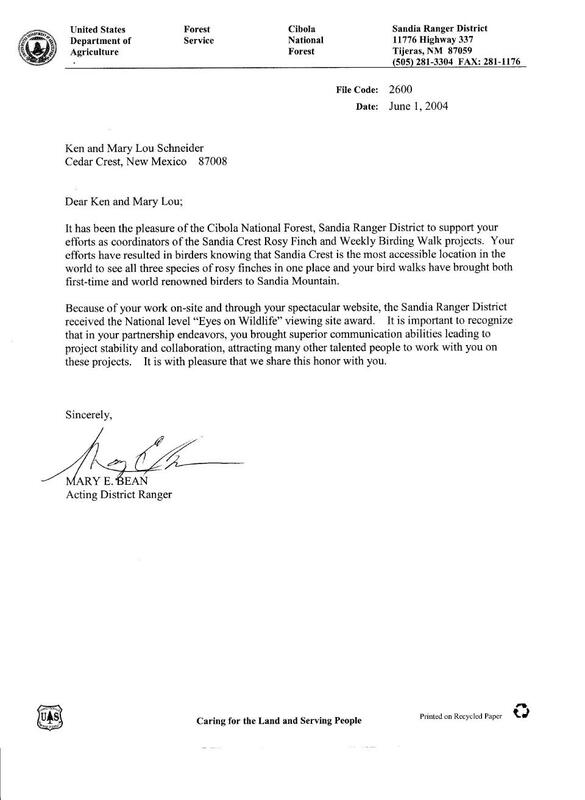 Here is the announcement from the Sandia Ranger District of the Cibola National Forest. "Improvements will be made to the Capulin Springs Picnic Area, site of the “Bird Log” that attracts many photographers and birders. The Capulin access road intersection with Highway 536 will be reconfigured and relocated about 250 feet to the south in the interest of traffic safety, as it also serves the Snowplay area and is heavily used during the winter. Of interest to birders, the one-lane side road that ends at the loop where “The Log” is located will be permanently closed to public vehicles at the existing seasonal gate. Six parking spaces would be constructed above the gate, making the one lane road available for walk-in traffic by the public. The road would be left for administrative uses only. The existing deteriorating log at Capulin Spring would be replaced with a natural log cut from a dead tree in the local area." According to the decision paper, the majority of the sites northeast of the gate would be removed and the sites replanted. There would be five tables which would be placed east of the gate near the lower bathroom. Pedestal grills would be installed near the five picnic tables. The table at the end of the existing loop will be replaced. The cinder-block toilet near the gate will be demolished and the existing toilet towards the end of the one lane road be replaced. Thank you all for your valuable input. After the snow has vanished, we hurry to visit Cienega Picnic area, located at about the 1.8 mile mark of the Crest Road (NM-536). One of the marvels of living in a mountainous area is seeing how the flora and fauna can change with altitude. While Sandia Crest still seems to be sleeping under a blanket of snow, early spring brings hordes of wildflowers and butterflies to Cienega and the associated Doc Long Picnic area/Bill Spring Trail. A good spot for summer resident Virginia's Warbler, Grace's Warbler, Black-headed Grosbeak, Western Tanager and Plumbeous Vireo is the "trash trail," identified as #190, that is accessed by parking at the "T" where the south bound Cienega Picnic Area entry road meets a paved road that is blocked to the left (east). Walk down the paved road past the barriers to the end of the pavement, then bear right and eventually you will have turned 180 degrees and find yourself in a small open valley that leads back up the main mountain into Armijo Canyon (Trail #222). We once found the nest of a Plumbeous Vireo in a juniper just at the end of the paved road. Do not confuse the base of the Sandia Peak Ski Area, at the 7 mile mark, with Sandia Crest, at 13.5 miles, the very top. There are no Rosy-Finch feeders at the Ski Area! The Tram from Albuquerque goes to the Peak, which is a mile south of the Crest. The 1.5 mile trail connecting the Peak and Crest should not be attempted by casual hikers, especially in winter. Take I-40 West from the Texas Panhandle to Exit 175 (Cedar Crest/ NM 14). Exit right from I-40, and turn right on NM-14 Northbound. Follow NM-14 signs north past Cedar Crest, total of about 6.0 miles, to NM 536 westbound, also known as the Crest Road or the road to the Sandia Ski Area. There is a gasoline station on the right side of the street just before the left turn. Take NM-536 all the way to the top, about 13.5 miles (10,678 feet elevation). Look for Clark's Nutcrackers and Northern Pygmy-owl at the ski lift area, and Cassin's Finches and Pine Grosbeaks all along the higher reaches of the road. The road to Sandia Crest, which is fully paved, is usually well maintained (plowed and heavily sanded). Because of the ski area, it is essential for the Forest Service to keep it open to the ski lifts, which are about 2/3 of the way up the 13 miles to the top. Sometimes after a particularly big snowfall, or if there is a lot of blowing snow, there can be drifts and early morning ice in the upper reaches. Be particularly careful at curves and at stretches of road that are in the shade. We have never had trouble in our 4WD Nissan Pathfinder, and a front wheel drive sedan should be able to make it even without chains if the road is sanded and there are no drifts. If you arrive after a snowfall, call the Sandia Ranger District (281-3304) and ask about road conditions. The State Highway Department Web page provides information about road conditions. Note the date and time of the advisory as it may be out of date, or call Road Advisory Hotline at: 1-800-432-4269. Be sure to check the weather and not attempt the drive up the mountain in heavy snow or immediately after a snowfall. Sandia Crest House Gift Shop and Restaurant may be contacted at (505-243-0605) during business hours if you are wondering whether the road is open. Crest House will not open if sufficient staff cannot report for duty. Check the Crest House Web page for latest information on hours of operation. Be alert for rosy-finches on the way up, at the Ellis and 10K Trail heads. We also like to first check for rosy-finches from the lower Crest parking lot, just before the the very top. They often roost in the trees around the parking lot, and can be observed if you use your car as a blind. The lower feeder near the parking lot is readily visible. Then, drive up to the the parking lot at the very top, and enter the Crest House where you can view the deck feeder through the windows or from the patio. There is a $3.00 parking fee (fee is waived for holders of Golden Eagle, Golden Age and Golden Access Passports) which is retained locally by the Forest Service to maintain and improve the picnic areas and other facilities. The Crest House has designated handicapped parking in the upper lot, but snow and gravel may obscure the stripes and markings. The walk to the entrance is paved but at a moderate uphill grade. It can be slippery, so use extreme caution. If your mobility is impaired, use the right (west, or restaurant) entrance, which has no steps. There is a powered wheelchair lift that accommodates a wheelchair and an attendant, providing access to the main floor and Rosy-Finch viewing area below. Because of the very high high altitude (each breath at 10,678 feet delivers one third less oxygen than at sea level), it is safer to acclimatize by spending at least one night at 5000 to 7000 feet, and making several short trips rather than venturing up for a long period of time. Even if you are in good health you should avoid over-exertion and drink plenty of fluids, and retreat to a lower elevation if you suffer symptoms such as headache, weakness, nausea, or dizziness. If you have heart or circulatory problems you should consult your physician. Click Here for Information about Altitude Sickness. At Cienega Canyon Picnic area there is designated parking at the Nature Trail head. The trail is paved and wheelchair accessible for nearly 1/2 mile as it loops to the west into the Group Picnic Area, crossing the small stream and following it through the riparian area. Braille signage and interpretive plaques that were vandalized have been repaired. This and most other picnic areas are closed during the snow season. All developed Picnic areas have handicapped spaces in the parking lots and usually have one or two tables that are more accessible. Doc Long, Capulin Spring and Nine Mile Picnic areas have parking places amid the trees (Ponderosas at Doc Long and mixed conifers at Nine Mile). There are plans to further improve access to "The Bird Log" at Capulin Spring (see Blog entry and comments about it here). The trail at Balsam Glade, while not paved, is quite clear and level. It is possible to bird effectively from your vehicle in the parking lots and along the Crest Road, but do not stop in the roadway and especially not on curves. Use pullouts or the shoulder where not prohibited. Be patient. The Rosy-Finches seem to come and go about every 30-60 minutes, in compact flocks. Once the juncos start feeding, it is a good omen (though the Rosies will not alight on the feeder if Steller's Jay is present). While there, be sure to pick up some souvenirs and have a hot beverage-- and let the staff know that the Rosy-Finches brought you there! Some may find this guide useful in reporting sightings along the Crest Road, more properly called the Sandia Crest National Scenic Byway (NM 536). There are mileposts most of the way, starting at NM 14, where NM 536 originates, up to Sandia Crest. Elevation gain is 3,828 feet, and you may experience a drop in temperature of as much as 20 degrees, depending upon cloud cover and climate conditions (average about 11 degrees). Be sure to bring an extra layer of clothing at any time of year, a hat and sunscreen. Every 1000 feet is the equivalent of traveling 300 to 600 miles northward-- like driving to Hudson Bay, Canada in a half hour! Start birding the first mile (6,850'), where Scrub Jay, Townsend’s Solitaire, Western Bluebird, Spotted and Canyon Towhee, Bushtit, Mountain Chickadee and Juniper Titmouse may be found in roadside pastures, door yards, and in the piñon-juniper woodland. In summer, look for Black-headed and Blue Grosbeak, and Ash-throated Flycatchers. Curve-billed Thrasher and Cedar Waxwing have been seen in Pyracanthas at the edge of the Triangle Grocery Store parking lot. 0.7 mile— The Sandia Park Pond appears on the left (south) side of the road. Drought reduced it to a puddle, and it was deepened and provided with new rubber liner late in 2002. Unfortunately, the muddy shoreline that formerly attracted sandpipers has been replaced by cobbles set all along the perimeter. It will probably be sterile for a few years. It is still worth scanning any open water for resting puddle ducks (Mallard, Cinnamon Teal, Green-winged Teal and Ring-necked Duck at times). Ladder-backed Woodpecker and Red-naped Sapsucker may be seen in the Lombardy Poplar trees that border the pond. During breeding season, Black-headed and Blue Grosbeak, Western Tanager and Lesser Goldfinch may be seen. In August, 2005 a Brown Pelican made its appearance here. 1.6 mile— Enter Cibola National Forest (7,130'), as Ponderosa Pines and Gambel Oaks predominate. 1.8 mile— On the left is the entrance to Cienega (CLICK for more detailed description) and Sulphur Canyon Picnic Areas (7,240'). Interior roads are closed most of the winter, but the parking area here and at Doc Long Picnic Area (2.0 miles) should be explored for Steller's Jay, Mountain Chickadee, Pygmy, Red-breasted and White-breasted Nuthatch, Pine Siskin and Red Crossbill (most years), and Grace's Warbler in spring and summer. Sharp-shinned Hawk and (rarely) Northern Goshawk have been seen in the woods adjacent to the parking areas and along the short trail that connects the Doc Long with Sulphur Canyon Picnic Area. Red-naped Sapsucker nests here and may be found any time of year. During Spring and Summer, Cienega Canyon Picnic Area is great for Western Tanager, Plumbeous Vireo, Warbling Vireo, Virginia's and Grace's Warblers, Black-headed and Blue Grosbeak, and Cordilleran Flycatcher. Sometimes Olive-sided Flycatcher is seen in the tall snags. Of geologic interest, just between Cienega and Doc Long, is the "Great Unconformity," where limestone deposited at the bottom of an ocean 300 million years ago lies directly on top of granite that is 1.3 billion years old-- a gap that represents over a billion years of missing geologic history! 3.0 mile— Look for Northern Pygmy-owl along the road from here onward. To the left, on the drier slope beneath the road, you may find Green-tailed Towhee during breeding season. They often sing in the shrubs along the side of the road. There are several pull-outs on the outside edge of the road-- plan to stop there more safely on the way back down and look/listen for the towhees. During winter, this is also a pretty reliable place for Townsend's Solitaire. 3.3 mile— Old hollow tree up on the right, with many south facing woodpecker holes may soon topple over. Check it out for owls. Do not expect either the Northern Pygmy-owl or the Northern Saw-whet Owl to pose in their doorways, however. Western Bluebird may also use these holes. Violet-green Swallow also utilizes the woodpecker holes any where from here to the top of the drive. 4.1 mile— Tejano Canyon overlook (7,800-8,280') offers a sweeping view of the valley below. Resident Red-tailed Hawk and other wandering raptors may be seen, especially as migration season begins. White-throated Swift become more likely over open areas on the ascent. 5.0 mile— “The Hollow,” where Northern Saw-whet Owl sometimes appears at dusk and may call or respond to imitations of its call after dark and well into the night. Check the woodpecker holes in trees to left side of road. They do not normally sit at the entrance of a nest or roosting hole but may be seen nearby. 5.6 mile— Tree Spring Trailhead (8,480'). Clark’s Nutcracker has appeared here in winter when it was scarce at higher elevations. Pygmy Nuthatch may be seen. During breeding season, Grace's Warbler sings from the tips of the Ponderosas, which are gradually replaced by White Fir, Douglas-fir and Quaking Aspen over the next three miles. Great Horned Owl is heard at night. Northern Saw-whet Owl may be called up after dark, any time of year. During spring and summer, great for Flammulated Owl but don’t look for them in the winter! 6.0 mile— Dry Camp (8,640') has a few large Ponderosa snags that can attract woodpeckers: Northern (Red-shafted) Flicker, Hairy and Red-naped Sapsucker drum there in the spring. Red Crossbill and Cassin’s Finch may be present during invasion winters. 6.2 mile— Another old "woodpecker tree" that may harbor owls. Listen at and after dusk. 6.6 mile— The large turnout on the right has been good for Red Crossbill in past years. 7.0 mile— Sandia Ski Basin (8,609'). The Northern Pygmy-owl likes to sit on the wires next to the telephone pole at the right side of the road, about 100 yards past the driveway that serves the Ski lift area. During winter, Clark's Nutcracker may congregate along the ridge to the left to collect food scraps left by skiers. Red-naped Sapsucker may be seen at roadside, nesting in the aspens and taking sap from the exotic Siberian Elm trees. 8.1 mile— Capulin Spring and the Capulin Spring Snow Play Area (8,840') is the site of the famous “Log at Capulin Spring.” Crowded during snow season and hard to find free parking, but Northern Pygmy-owl and Northern Saw-whet Owl may be found here during winter as it gets dark. Far more pleasant is owl watching after sunset during midday into early July, when the pygmy-owl is calling actively, and often Northern Saw-whet and Flammulated Owl can be heard. The road into the Snow Play area is one of the better places to find Dusky Flycatcher, near the southern extent of its breeding range, in June and July. 9.0 mile— Nine Mile Picnic Area (9,200') is closed in winter, but Pine Grosbeak has been reported in this area, and Cassin’s Finch and Red Crossbill may abound in good winters. Warbling Vireo are numerous during May and June, and Gray-headed (Dark-eyed) Junco nests here. Williamson's Sapsucker may breed in this area and at higher elevations. Mixed conifers have now replaced the pines, and wild raspberries grow in open areas. Both Ruby-crowned and Golden-crowned Kinglet may nest high up in the conifers from here up. During winter and migration season, look for Merlin that may perch in the high snags along the road as you progress upward. Clark's Nutcracker usually becomes more common from here up. 9.5 to 11.0 mile— Here, a series of switchbacks offer good vantage points to search for winter finches and raptors. Violet-green Swallow nests in the tall snags at the 10.5 mile switchback-- it arrives first week of April or even late March.. Park above the curves, and only if the shoulder is wide and clear. Never park on a curve. Obey parking restrictions. 11.7 and 12.0— Two large switchbacks also offer good viewing. Pine Grosbeak has been seen at 12.0. 12.3 mile— Ellis Trailhead (10,260') also offers views to the right (north), where Rosy-Finch may gather. During mid-winter, Pine Grosbeak may be seen 100 yards or so upslope (to south) along the groomed alpine ski trail. Do not disturb the ski tracks-- walk along the edges where the snow is undisturbed. 13.0 mile— Final big switchback (10,540'). Note the protective raptor perches on the power poles where the lines pass over the highway. Not safe to park here, but look for Pine Grosbeak and Northern Goshawk, both reported here during winter of 2001-2. Vegetation is now largely spruce and fir. 13.5 mile— Sandia Crest parking lot. (VIEW TO THE SOUTH FROM OBSERVATION AREA) During the winter, enter the first lot and check out the feeders from below, before going up to the final level and viewing Rosy-Finch from inside the Crest House! In summer, scan for White-throated Swift. During the warmer months, a walk south along the Crest Trail leads through a sub-Alpine forest with interpretive signs, to Kiwanis Meadow, where nesting Green-tailed Towhees and (Audubon's) Yellow-rumped Warbler abound. Both Ruby-crowned and Golden-crowned Kinglet nest high in the spruce and fir trees here. The trail also leads north, just east of the electronic communication tower site. House Wren is here in the summer, and Gray-headed (Dark-eyed) Junco may be found all year round. TWO AMERICAN THREE-TOED WOODPECKERS were photographed on June 4, 2005 on Sandia Crest east of Albuquerque on the trail that leads to the Kiwanis Meadows from the lower parking lot. They were 100 yards down from the gate at the south end of the lot near several downed trees on the left hand side of the trail. There were signs of trees with their bark stripped. There was still snow up there. A drumming male was then seen on June 5, 2005, and several times through the next year. A male was again seen drumming on June 3, 2006, just east of Kiwanis Meadow. These are the first confirmed sightings of this species in the Sandias after an absence of over 9 years. They may have produced young, as three or more were subsequently reported there at one time. Subsequently. an American Three-toed Woodpecker was seen from the lower parking lot of Sandia Crest on January 29, 2007. On March 25, 2007 one was seen on the path from the Crest parking lot near the Kiwanis Meadow as well as a calling Northern Pygmy-Owl, near the start of the track that leads downhill from the south end of the parking area to the Meadow. Celesten Brozek saw a female Three-toed Woodpecker feeding a full-fledged nestling on July 27, 2007, at the Crest, to the north of the radio towers. Gale Owings reported that on July 17, 2008, there was at least one female Three-toed Woodpecker to be found in the area about midway down the wide trail to Kiwanis Meadow from the south end of the exit road below the lower restrooms at Sandia Crest. "At about 1 PM, I had good looks at an actively foraging bird flaking bark off large spruce trees on either side of that trail around where several flattopped boulders border the upslope side and a large pile of recently felled trees lies on the downslope side. At about 4 PM, I observed the same or another female in that area as I was returning to the Crest via the Buried Cable bike trail, which is parallel to and below the aforementioned trail... FYI if you go looking, last July and in early November I found a Three-toed within the first 50 yds. or so down a marked trail to Ellis trailhead that splits off from the Crest trail just below Kiwanis Meadow. Judging from the amount of apparently fresh bark chips I saw on that trail, it still is another good place to check for the bird." On August 4, 2008, Danny Paez reported that while hiking near Sandia Crest he saw four Three-toed Woodpeckers. He started his hike at the Ellis Trailhead just up the road from the 10k Trailhead. At the intersection of the Switchback Trail and the Survey Trail he saw two female three-toed woodpeckers. "This is very close to the parking area. To get there from the trailhead go past the gate closing off the road. Just past this point there is an unsigned trail on the right. Take this a short distance uphill to the Switchback Trail. Take another right here a short distance to the intersection with the Survey Trail. Both birds were foraging close together in the same tree. I may have heard a third bird nearby, but I didn't see it. This location is very close to Kiwani's Meadow and the previously reported Three-toed Woodpecker. I continued up to the Crest Trail and went north all the way to the 10 k trail at its northern terminus... I then took 10k downhill to the Ellis Trail which I followed back to the parking area. About halfway along this section of the Ellis Trail I heard some tapping uphill. Investigating led me to two male American Three-toed Woodpeckers, also foraging in the same tree, with fantastic up close views. This area is probably under a mile from where the females were. If going north from the Ellis Trailhead it was about 1/3 mile past where the trail passes under some powerlines." Then, on August 5, 2008, four adult American Three-toed Woodpeckers were encountered along the trail to Kiwanis Meadow, and in the wooded area just east of the Meadow. This trail is accessed from the Crest House lower parking lot. Just walk south about 100 yards to the meadow, take the spur to the right towards Kiwanis Cabin, and start looking for the birds and the stripped bark that results from their feeding. Bill Wittman on January 9, 2009 had a female THREE-TOED WOODPECKER and two GOLDEN-CROWNED KINGLETS at the Crest. John Parmeter saw the THREE-TOED on January 11, 2009, just below the trail to the Kiwanis Meadows. Another was sighted at Sandia Crest on Feb. 22, 2009. Gale Owings reported a male and female on July 16, 2009. The full report is at this link. Another promising spot for three-toes may be the Ellis Trail Head and, just above it, 10K Trailhead. Click here, and then scroll down for a Panoramic winter view of this spectacular location. Be sure to check the latest New Mexico Ornithological Society's Statewide Rare Bird Hotline and the Sandia Crest Birding FORUM before starting out. Sightings are arranged by County. CLICK HERE for a map NM Counties and County Seats. Once we get some good snow the Capulin Picnic Area is closed because it shares an entrance with the crowded Capulin Snow Play Area, and the access road is narrow and is not plowed. I have visited in winter and found Golden-crowned Kinglets, Cassin's Finches, Clark's Nutcrackers, Evening Grosbeaks-- all fairly erratic visitors that can be seen elsewhere anyway, when they honor us with a visit. The spring probably keeps flowing but we had to do concrete work to get at and repair a leak (separated joint in the pipe) and I suspect it froze. In winter, the sides of the road up to the Crest can be good, yielding (rare) Pine Grosbeak, Goshawk, Merlin, Red Crossbill, Northern Pygmy-owl (look for them perched in oak trees along the road from about the 4 mile to the 8 mile mark), Saw-whet Owl, Clark's Nutcracker (often seen at the base of the ski area, which is about at the 7 mile point-- they beg for food from the skiers). Red-naped Sapsucker is possible even in winter. At the Crest, the winter feeder species list is still rather limited. Dark-eyed Junco, White-crowned Sparrow, Mountain Chickadee, White-breasted and Red-breasted Nuthatch, Steller's Jay, Common Raven, Clark's Nutcracker, Cassin's Finch, Red Crossbill, Pine Siskin and (once, in January, 2001) Pine Grosbeak have shared with the Rosy-Finches. Nearby, Frost Road (which is the eastward extension of NM-536, the Crest Road) is like a little "Hawk Alley." It becomes NM-472 and runs through a flat high valley for maybe 25 miles to the east towards Stanley-- grazing and farm land. In addition to Redtail, some Kestrel, N. Harrier, Prairie Falcon and Merlin, it has been fairly reliable for Ferruginous Hawk and Loggerhead Shrike (I still have not found the rare Northern Shrike). Sometimes there are Eastern Bluebirds in winter, according to other observers. There may be large flocks of Mountain Bluebirds there in winter. Western Bluebirds and Western Meadowlarks also persist there in winter. When Frost Road ends at NM-41, go south a few miles towards Moriarty for more great raptor habitat, and possibility of Horned Larks, American Pipits and Longspurs on the plowed fields if not snowbound. The sod farm in Moriarty is about 4 miles east from NM-41 on the service road that runs along the north side of I-40. Birders are no longer welcome to enter, but the roadside may provide glimpses of longspurs (and Mountain Plovers during migration). See Our Back Yard Bird List . We had Canyon and Spotted Towhee, Juniper Titmouse, Bushtit, Pine Siskin and Mountain Chickadee as well as Scrub and Steller's Jay at our yard feeders during winter. Pinyon Jays are irregular, but have had over 200 in the yard at once, turning the snow scene blue (I have a snapshot to prove it). Cassin's Finches visit almost every winter, with over a hundred at a time during two good invasions. Evening Grosbeaks are hard to figure out-- sometimes they visit in mid to late summer, other times in the dead of winter. When they do come, they usually stay for several weeks at least, but we have had spells of over a year without seeing one! Red Crossbills are only slightly more reliable, with invasion years and even summer visits some years. No crossbills visited our feeders from June, 2002, when an adult took two newly fledged birds to our sunflower seeds, until July 1, 2003, when flocks returned to breed in the Sandias. We usually have a pair of Ladder-backed Woodpeckers at the suet, and Townsend's Solitaire hang around most winters. In the Ponderosas look for flocks of Pygmy Nuthatch-- I saw 35 on the 2000 Christmas Count. The Rio Grande Nature Center State Park in Albuquerque, can be a jewel in winter. While it does not rival Bosque del Apache, there are plenty of waterfowl. Eurasian Wigeon has turned up several times. Redheads, Canvasbacks, White-fronted Geese, and Snow/Ross's Goose are possible. Sandhill Cranes will persist all winter if forage is good. The new wetlands with a blind is a major attraction. Bald Eagles usually are at the river and there is the possibility of seeing Great Horned and Western Screech-owls. A Peregrine may warm things up. Saturday and Sunday bird walks start at 9:00 AM during the winter, and they can be a lot of fun. Follow my link for more information, seasonal schedules and special events. Winter walks in Tres Pistolas or Three Gun Spring Open Space (Albuquerque Journal Story) , the entrance point to spring Hawk Watch (CLICK HERE FOR A PANORAMIC VIEW), jointly acquired by the City of Albuquerque, Bernalillo County and the National Forest) may yield (Slate-colored) Fox Sparrow. The Rufous-crowned Sparrow is a resident here and in the western foothills of the Sandias. Some Crissal and Curve-billed Thrashers, as well as Scaled Quail are found here and in Elena Gallegos Picnic Area (a County Open Space Park), north of Academy on Tramway and along the connecting system of foothills trails on the west side of the Sandias. I have seen winter Prairie Falcons in both places, but Black-throated and Black-chinned Sparrows only in the warmer months. Both of these areas can be quite pleasant when we might be shivering and shoveling snow on the other (green) side of the mountain. This is one of the more reliable places to find Scott's Oriole, which may appear as early a mid-April. See the Tres Pistolas Birding Page for more information. During the warmer months, a nice place for migrants and particularly for breeding Hepatic Tanager and Black-throated Gray Warbler is the southern end of the South Crest Trail, at the north end of the Canyon Estates Subdivision. To reach this area, take I-40 east from Albuquerque and exit 175-- stay to the right as exiting (towards NM 337 and Tijeras, NOT Cedar Crest) and immediately turn left under I-40 as if you were going to make a U-turn back west to Albuquerque-- but as you pass to the north under the highway, bear to the right and continue up Arrow Head (a Dead End road). Travel 0.7 miles all the way into and past the Canyon Estates Subdivision to the small parking area at the trail head. The pleasant 1/2 mile walk, mostly in shade, takes you along an inconstant stream to a waterfall that has extensive travertine deposits and a cave under it. It is fed by a spring and a watercress-filled creek above it. 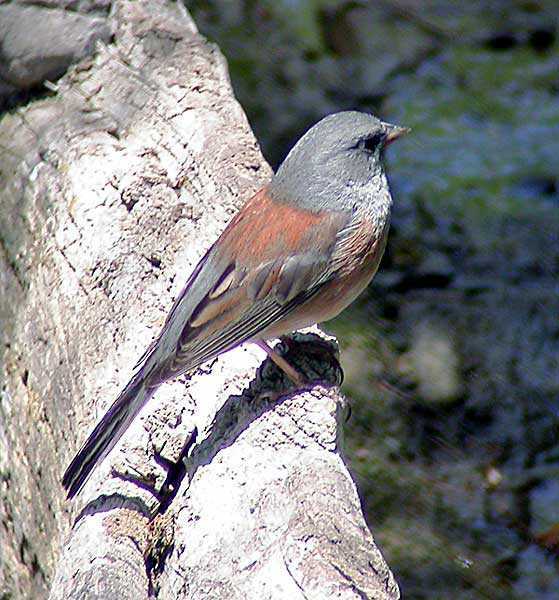 I have seen Townsend's Solitaire with fledglings in summer, Canyon Wren (on the cliffs above the waterfall), Band-tailed Pigeon, and one spring saw a male Rose-breasted Grosbeak. In the fall, look for Townsend's Warbler. Only 4.8 miles south of the Crest Road NM 536) intersection on NM-14 is Ojito de San Antonio (formerly Los Manzanares) Open Space, a beautiful place, and is a very productive birding area the year round, especially during migration and the breeding season. Look for woodpeckers, warblers, vireos, tanagers, towhees, buntings... all the birds you might see at this elevation (see the Birding Calendar in the Cedar Crest Back Yard Bird List for specifics). Almost exactly a mile north of I-40, on NM-14, on the west side of the road is the small stucco church of San Antonio de Padua. Park in the lot just behind and to the west of the church, but be aware that you may get blocked in on Sunday mornings by worshipers attending services. Walk west a few yards to the dirt road that leads to the north into this beautiful Bernalillo County Open Space acquisition. We often found Pinyon Jays in the Manzano-Four Hills Open Space. This area is along the east margin of the Four Hills Subdivision in SE Albuquerque. Take Tramway Boulevard south from I-40 past Smith's supermarket, curving to the left (east) to the "T" intersection with Four Hills Road SE. Go south on Four Hills Rd 0.5 mile to the "Y" where it meets Stagecoach Road SE. Follow Stagecoach to the left (east) about another 0.4 miles, where it turns to the right (south). From this point to the end of Stagecoach road there are a number of dead end streets to the left, one or two of which have marked trail heads. There are Piñon Pines and exotic conifers (which sometimes have seed when the natives do not) in the back yards along the street, as well as Piñons in the savannah to the east (the open space extends toward the Manzanito Mountain foothills and Kirtland Air Force Base). We often found Western and Mountain Bluebirds, as well as raptors there in the winter. You may also see flocks of Pinyon Jays in the Albuquerque Foothills, the open space area that is east of Tramway and west of the Sandia Mountains, i.e., that stretch of Tramway north of I-40. There are trail heads at the east end of Indian School Road Here is a link to maps of Albuquerque Open Spaces and trails. For a chart of species and their abundance during the summer months at three locations along the road to Sandia Crest, CLICK HERE. North of Santa Fe, look for breeding Lewis's Woodpeckers in telephone poles along the first two miles of NM-503 east of its intersection with US-84. If you are ambitious, and especially if the hotline sounds promising, check out the Santa Fe Ski Area in winter-- there have been White-winged Crossbill, Pine Grosbeak and Gray Jay there many winters. Dusky Grouse may be seen along the road to the top, especially with the approach of spring, near Aspen Basin. American Three-toed Woodpecker is a possibility at burn areas in the Jemez Mountains (particularly Forest Road 289 about 3.1 miles south of its junction with NM-4, and at Apache Springs Trailhead on NM-4 about 1.5 miles west of NM-501, the Los Alamos turnoff), but the best places to see them may not be accessible during snow season. Black Swift breed at Jemez Falls, 15 miles northeast of Jemez Springs on NM 4. The swifts may best be seen in late July and early August, either over the parking lot or along the streambed just above the falls. They are very hard to see from the observation area below the falls. CLICK HERE for a picture of JEMEZ FALLS. The Valles Caldera National Preserve, also near Los Alamos, merits a visit if only to scan the huge herds of elk that gather in the fall. Blue Grouse, Northern Goshawk and Golden Eagle may be seen by hiking the (free and unguided) Valle Grande Hiking Trail, which is open only Friday through Monday at 8:00 PM. CLICK HERE TO SEE OUR PANORAMIC PHOTO OF THE CALDERA TAKEN AT THE END OF THE TRAIL. This easy 2 mile hike is along an old wagon trail that wanders through a lovely wooded area on the Southeast corner of the preserve and eventually opens up to a view of the floor of the Caldera. Parking is located on the south side of State Rte. 4, where the sign says "Entering Bandelier National Monument," with the trail head across the street on the north side. Lewis's Woodpeckers may also be seen here. Central NM Audubon Society sponsors frequent field trips, including local bird walks almost every Thursday morning. Visit Surfbirds.com for world birding news.